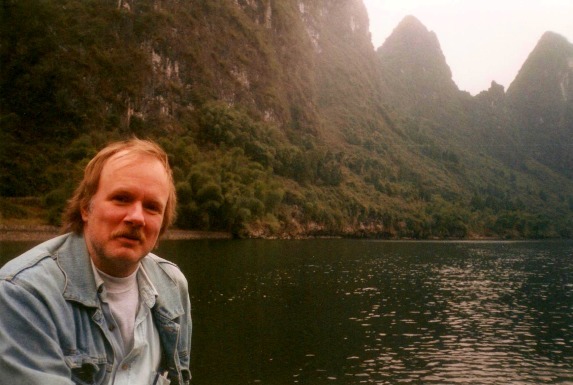 I had gone to Hong Kong to teach a one-week course, and then ventured inland into the People's Republic of China. After a day in Guangzhou, I had taken an overnight train to Guilin. 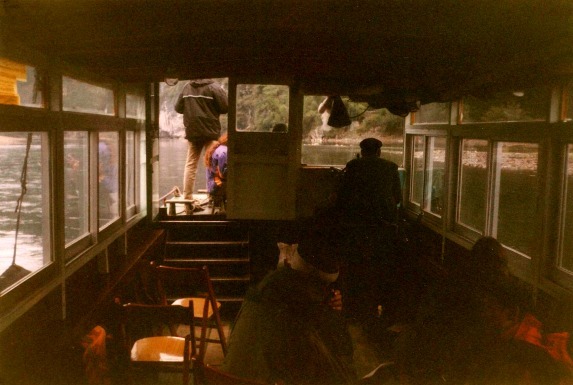 From there I caught a minibus south to Yangshuo. 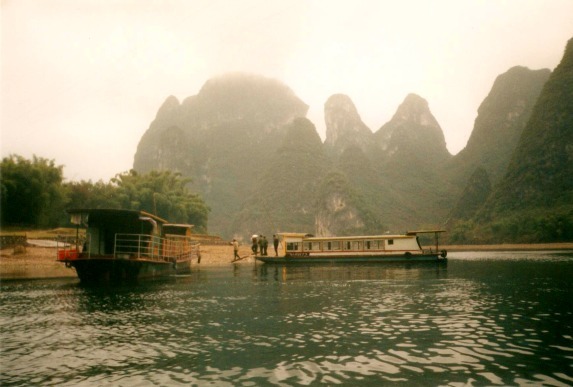 Soon it was time to head upriver in search of the mad Colonel Kurtz as Doug and I joined some other travelers on a trip up Li Jiang, the Li River. 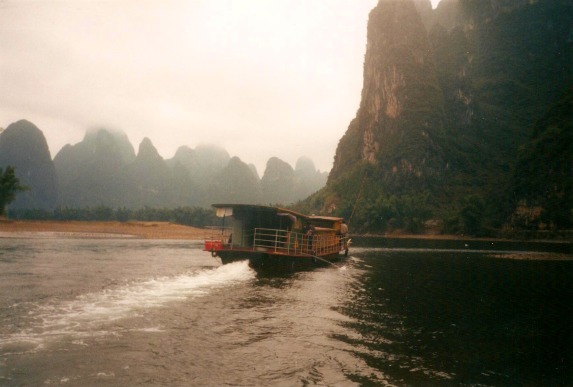 We went to Xingping, and then took a small boat further up the Li Jiang toward Guilin. We caught a minibus to Xingping, about a 45 minute ride from Yangshuo through agricultural land (a mix of rice and vegetables) spotted with these fantastic limestone towers. Once in Xingping we went looking for the riverfront. In Xingping we walked up the Main Street. It is rumored to have a layer of concrete underneath, but that is covered by a finely diluted sheet of mud. I thought that the former Soviet Union had a lot of concrete and mud, but there's a lot here. On the main street through Xingping. Main Street intersected with The Other Street — we turned right and followed it (dodging the pigs) to the One World Cafe at its end. We got some lunch (Rice-N-Spam with PBR, all they had and not really a surprise) and met the others going on the trip. 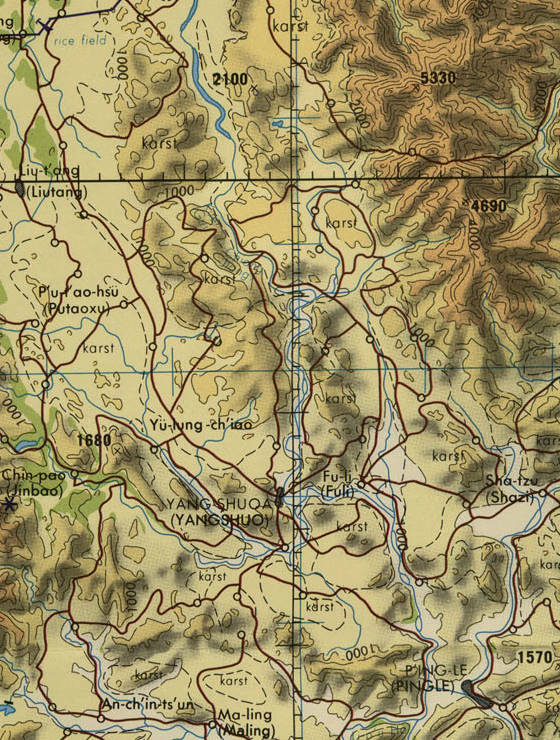 The maps below show this part of Guangxi Province with Guilin and Yangshuo. They are from the University of Texas' Perry-Castañeda Map Collection. 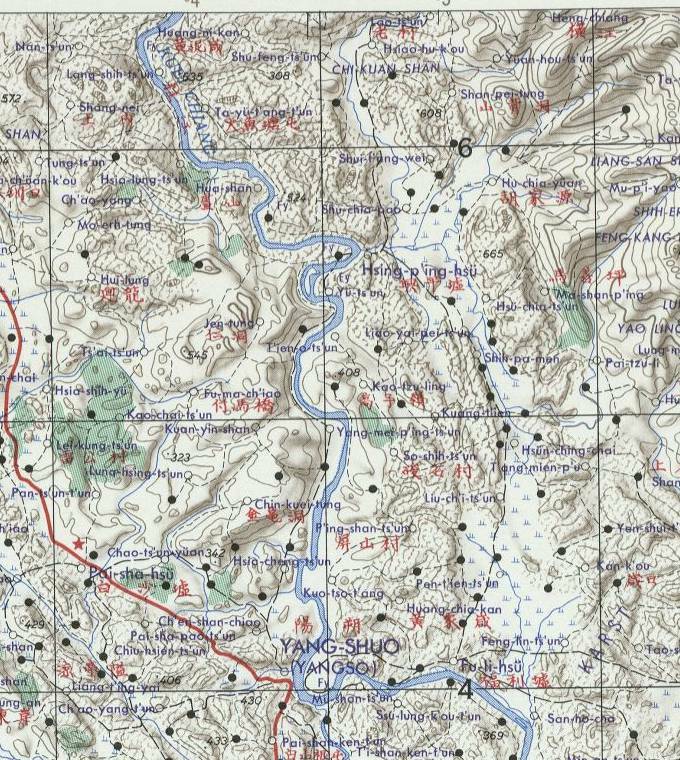 The first map shows Xingping, marked here as Hsing-p'ing-hsü as it uses an earlier Romanization system. 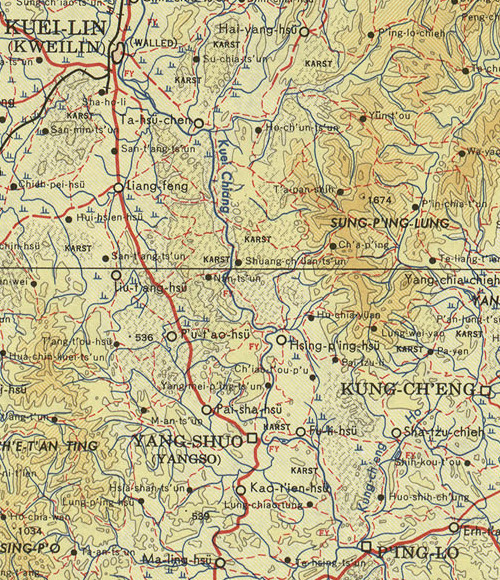 The second map shows more physical detail, but it doesn't show Xingping at all. Standing on the Li River pier in Xingping. We went down to the pier and got onto a boat. The boats are long low-slung affairs with an engine in the rear, a wheel at the front, and most of it enclosed in a cabin consisting almost entirely of windows. 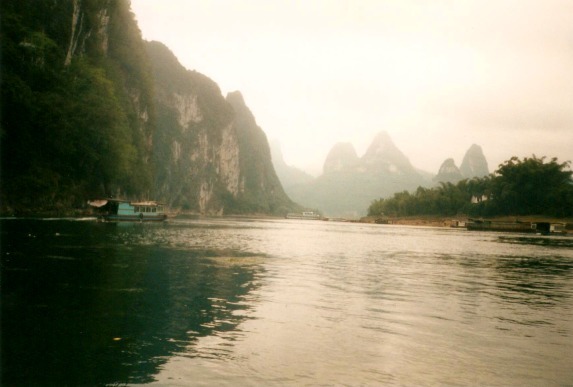 The scenery was fantastic — Xingping is on a bend of the Li River with huge hills and limestone towers all around. 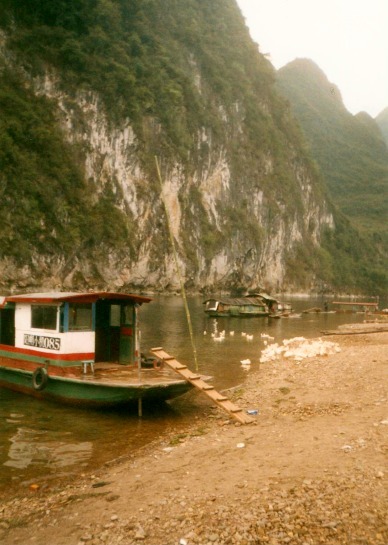 Boats lined up at the Li River pier in Xingping. There was our captain at the wheel, and his wife sitting beside the fire glowing in the large iron vessel at the center of the cabin. Neither knew any English. 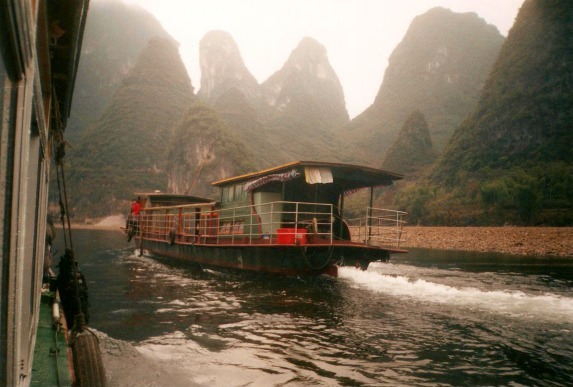 The trip spent two and a half hours heading upstream, traveling maybe 10 kilometers from Xingping against a current that was swift in places. The river was very shallow in places, so the boats all have very shallow drafts. The water was clear, the gravel bottom was clearly visible in places. 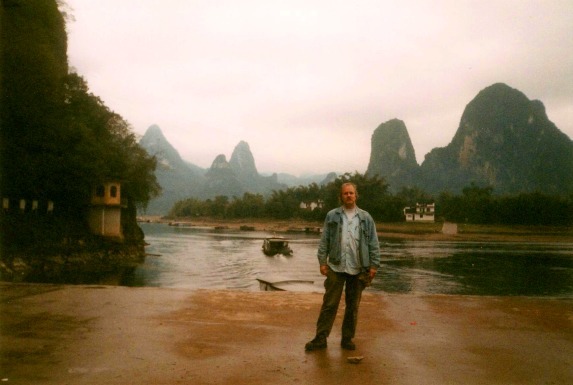 The scenery was amazing — cold and cloudy, low clouds, very much like my image of classical Chinese paintings. The hills (peaks, columns, whatever) are 100 to 300 meters tall. They are formed from some sort of differential erosion — limestone with mostly horizontal strata. 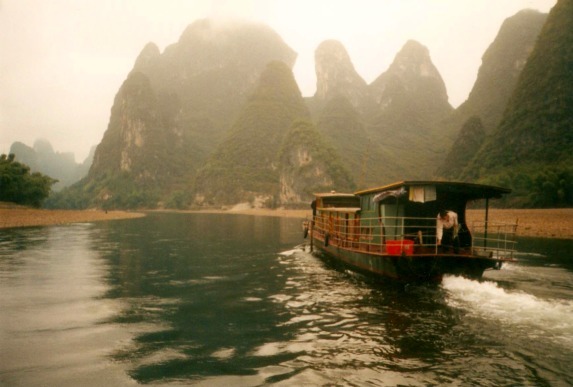 Heading up the Li River. Pulled up onto a sandbar. The banks are lined with large feathery bamboo, and appear fairly tropical despite the cold weather. The hills are covered with brush, except for the bare rock faces and cliffs. There are some simple villages along the river. Most of us sat out on the small foredeck for a while, but it eventually got too cold and we moved inside. Slowly catching up to another boat. The boats have shallow drafts, so there should be room to pass. We passed a few similar boats. We also passed several men riding rafts made by strapping four or five bamboo shafts together. These rafts were maybe seven meters long but just barely above water at the center. The men very casually stand on the rafts and ride them downstream. Some were cormorant fishermen, others were just using the Li Jiang to get around. 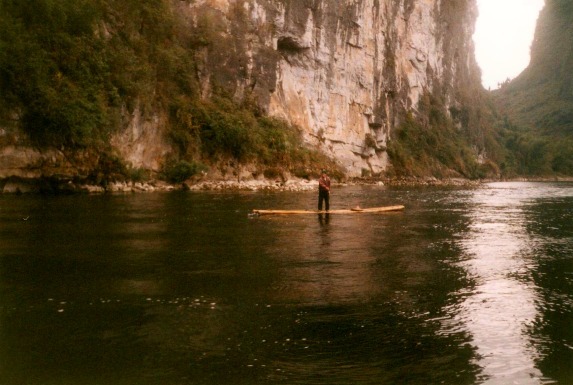 A man rides a narrow bamboo raft downstream. Stopping for a short break. 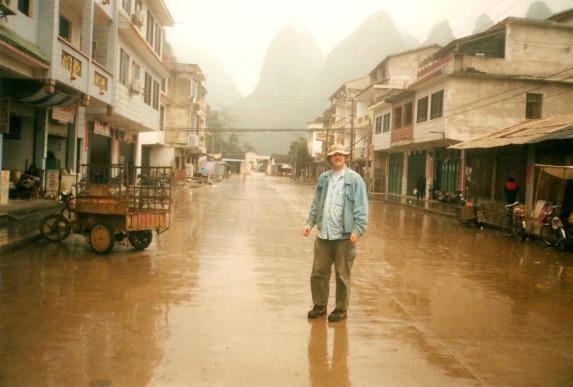 Then the time came when I had to leave Yangshuo. I had arranged a seat in a shared car to Guilin. The traffic in Guilin itself was maniacal. While the roads were fairly wide, there was no concept of lanes. Just a bunch of vehicles traveling more or less in the same direction, with the exception of those vehicles (probably no more than 5%) traveling the wrong direction. Left turns across traffic and U-turns were made with no signal and no regard for oncoming vehicles. Vehicles darted into the roads from both sides without looking. 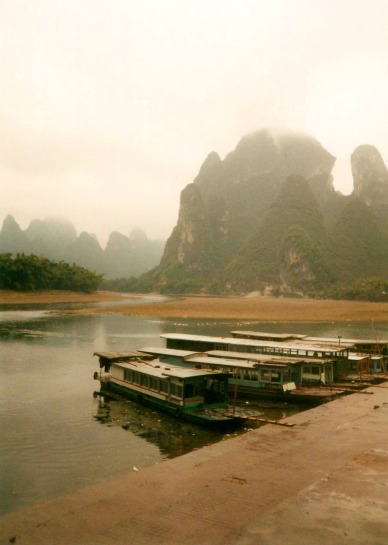 While Guilin is a fairly large city (pop. 1.3 million), I only saw one functioning stoplight. All other major intersections have a paved square area 100-200 meters wide in which utter chaos rules. This is probably why most vehicles don't have fenders. 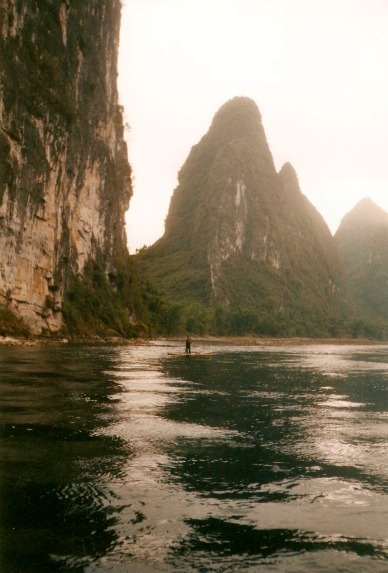 The reverse of the 20 RMB note shows this area of the Li River. Guilin airport is well outside the city, on a dedicated highway running to the airport with nothing else along it. But a few hundred meters outside the airport parking area I saw two couples leading water buffaloes to the airport terminal. I have no idea what they were going to do at the airport with water buffaloes. The airport terminal itself is a modern building, but damp, unheated, and nearly unlit. The gift shop featured snake wine, a 750 ml bottle of "wine" (really some jet-fuel-like liquor) in which a meter-long snake has been pickled. They also had Famous Precious Cigarettes, which have become truly famous (if not precious) as one of China's exports. Then it was a flight from Guilin to Shenzhen in a B737 with very large registration numbers painted on the upper and lower surfaces of the wings for positive air-to-air identification. From there, a jet catamaran ferry to Hong Kong and a night there before the long flight back to North America.